Baconfat Log: A Dozen Zombies and More! A Dozen Zombies and More! I've added a number of zombies to the horde. First this group of evil zombies are four Wall Street business men responsible for the world's financial crisis. The models are from Blue Moon's "Things that go Bump in the Night" line. Blue Moon make decent models but all the men in box 8 "I Can't Seem to Get a Good Night Sleep" set #2 all seem to have 1970's style haircuts. 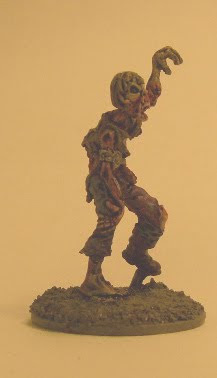 Here is a Reaper Zombie model that I really thought was terrible. That was until I painted it. The sculptor outwitted my terrible painting with a good sculpt. Reaper zombies are quite large, maybe 32mm scale. Here's two Mantic Games ghouls with zombie paint jobs, next to a dull witted Wargames Factory Zombie, sans arm. I didn't know where his arm was when he bumped into the painting cue, so I painted his dead a** anyway. 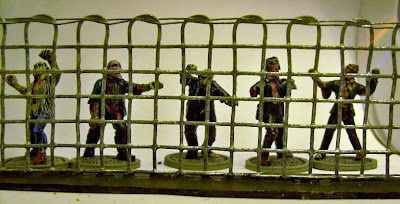 Here are some sliced up Heroclix models with additional paint for zombification. I know they're super hero ladies, but can't remember any of there names. 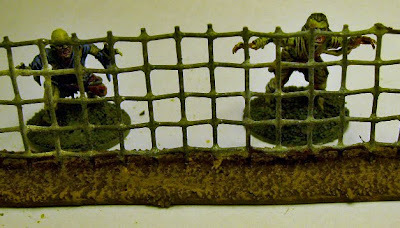 I've been expiramenting with chain link fence creation and here's what I've made so far. They are out dated metal cast (for broken bones) frames glued into cardboard. One is "dirt" and the other is on black cardboard, until I can figure out how to simulate asphalt. 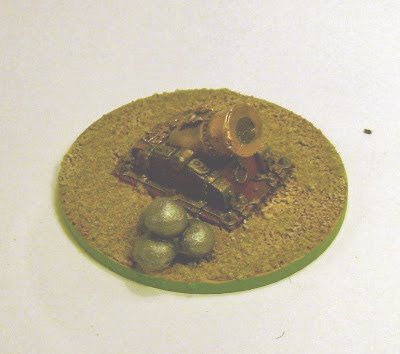 I have a bunch of painted "Empire" GW models including artillery crews without artillery pieces. I painted a few up, here are two of four that are done. I simply painted the base colors, painted on "dip" and then flocked them. I'll have more done real soon. 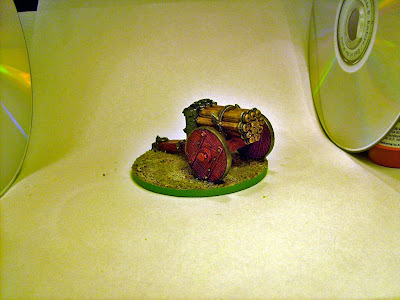 This is a Ral Partha organ gun that I started ages ago and recently decided to get off the painting table. It's a silly gun that looks extremely heavy with no way to move it. An enemy could simply choose to avoid it. 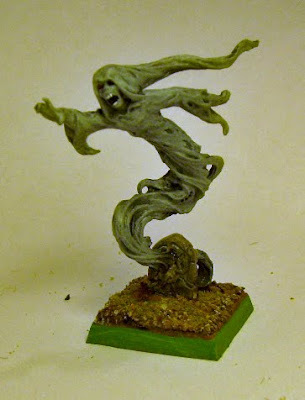 During a zombie model search I found this prepainted ghost. I really appreciated how much better the minimum wage third-world country painter could paint than me. So I bought it and upgraded the base. 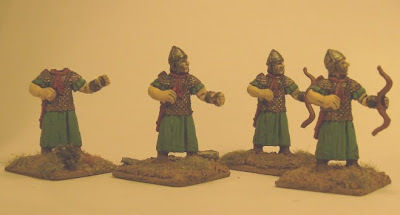 Lastly are four RAFM eastern Roman archers, that I painted 20 years ago (quite terribly) that I've touched up. Two of them appear to be missing heads or bows, but are really using the WAB 2.0 rule for Eastern Roman invisible bows and ghost heads. It's an obscure rule hidden in a French Canadian rules Faq that must be ordered via snail mail directly from Forgeworld, but somewhat useful versus NKE armies. My son is playing Warhammer 40k. 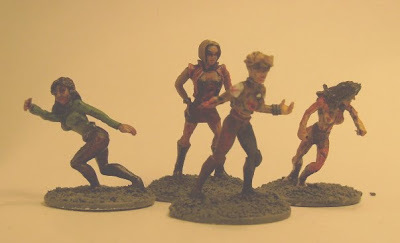 I have another blog, on which are figures that I painted for my son. I think that this blog will be interesting. I'll check the other blog out. Your rust work is truly amazing! Zombies vs Romans sounds interesting. 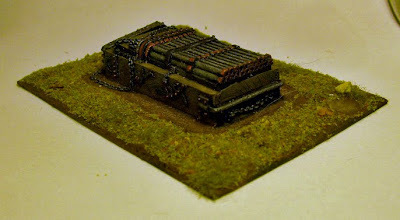 I have an old set Zvedza's plastic undead Romans that might fit in well. Wow. I just went to your other blog and that large base you just made is beautiful. The leaves and plants are amazing; I have no idea where to get quality terrain making material like that. Sorry that I did not answer. The secret bases are wildflowers. You have to collect them in a meadow ;). Then preserves the flowers Pharmaceutical Glycerine. The 50/50 water and glycerin. Retain color and dry. It's the whole mystery.